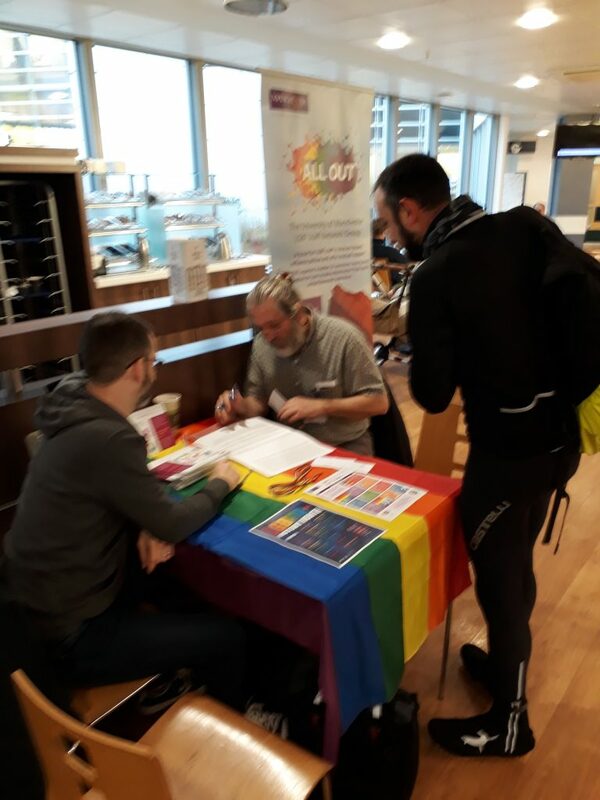 The cyclist breakfast on the 6th of February was at Manchester Children’s Hospital, and, as February is LGBT History Month, it was the Rainbow Ride. 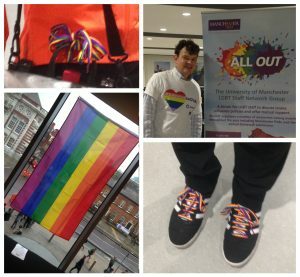 Rainbow laces, ribbons and badges were given out, as well as information relating to LGBT History Month events in Manchester, and the University of Manchester Equality, Diversity and Inclusion calendars. This entry was posted in News on February 25, 2019 by Geoff Blunt. 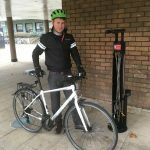 We have some great cycling facilities at the University campus, including schemes to make bike purchasing easier, swipe card-protected covered parking, repair stands and regular events aimed at increasing the number of regular cyclists. So successful have these incentives been, that now 11% of staff regularly cycle to work1; that’s about 1,100 people. 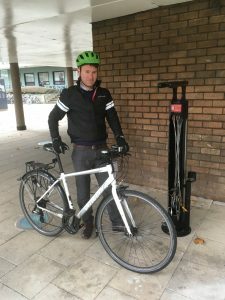 This is great news, until you realise that there are only 1,031 covered bike spaces to park in – a third of which are shared with the students, who also cycle in large numbers. 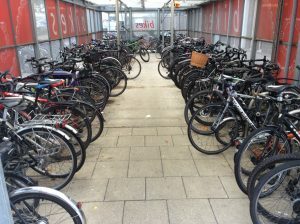 That’s a lot of people competing for not many spaces to keep their bikes from rusting in the Manchester rain. Contrast this to the situation with car parking provision, and we find that, although only 2,604 staff regularly drive1, there are 3,124 car parking spaces on campus2! 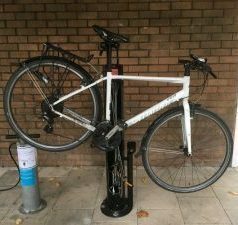 Some very dedicated people have been collecting data on cycle shelter usage3, and regularly find that in peak times they are filled to capacity (and beyond, you often see extra bikes jammed into unlikely spaces in desperation). 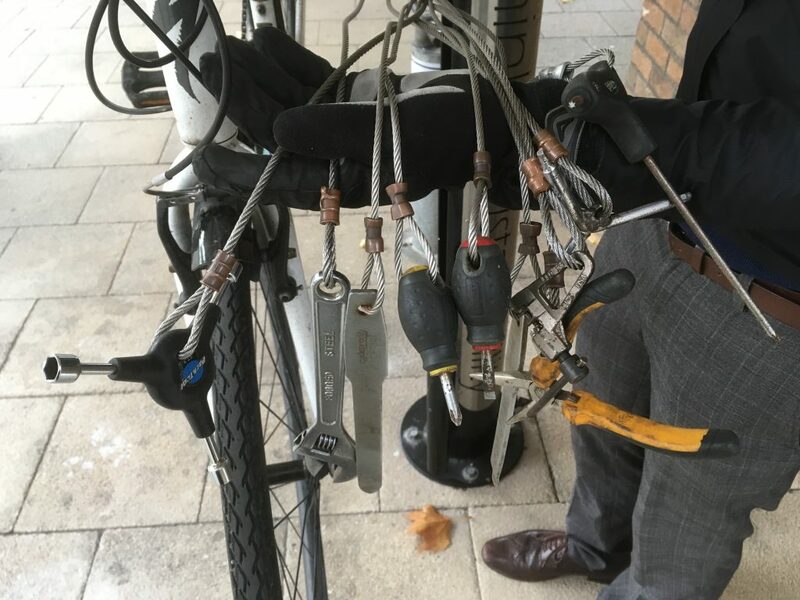 It’s impossible to say what effect this might be having on the uptake of cycling – who wants to make the change to a regular cycle commute if the chances are that their beloved bike will be exposed to the elements all day? It’s also a pretty regular sight to see cyclists taking their bikes into buildings, much to the exasperation of cleaners, fire safety officers and anyone who trips over it in the office. 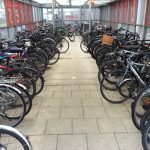 All of which sounds like a big moan, and the intention is not to say that there is some zero-sum game with cycle and car parking provision, but to underline that the disconnect between the relative provision for each travel mode seems out of kilter with the University’s sustainable travel goals, one of which is to reach 25% of staff regularly engaging in ‘active travel’ by 20224. So we’re starting a petition to ask the University to invest in more covered bike stands. It can be accessed here (University login required). Please read it and submit your agreement to the statement, we aim to take it to the University this summer. This entry was posted in News on January 23, 2019 by Geoff Blunt. Join in the conversation on UMBUG Facebook with your tips and advice. After what has been a hot and intense summer, autumn is back with a change in the weather and dark nights. 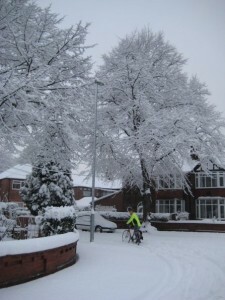 Some cyclists will be putting their bikes away, waiting again for the light nights and sunny days of spring. Autumn and winter cycling can seem daunting, the traffic sounds louder when the roads are wet, the dark might seem more dangerous and more people take to their cars for the school run, to pop to the shops or just to avoid the walk to the station.However, more traffic means that it is often moving more slowly so it’s actually a great time to be on your bike! Check the weather forecast the night before and get all your kit together so you’re not dashing around in the morning trying to find your waterproofs or lights. It’s also worth keeping a spare set of clothes in your office if you can, just in case you get caught in unexpected rain. More regular cleaning is important, especially the chain and drivetrain components as the muck you pick up will act to wear the cassette and chainrings. Check your tyres are properly inflated. This helps stop mud, which can conceal all sorts of sharp nasties, being picked up and sticking to your tyres. Carry a spare tube – it’s much quicker than a repair kit or a long walk in the rain. You should think about mudguards, if appropriate,to protect yourself and other road users from spray. You might want to invest in a decent waterproof jacket – if you’re riding at night something highly reflective is good. 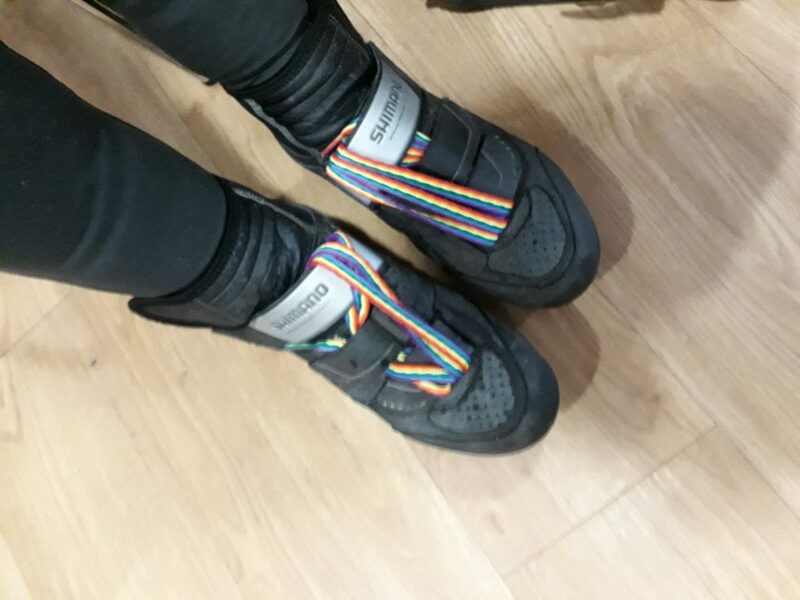 Decent jackets can be expensive but staff can buy safety equipment (like lights, jackets, helmets) through the Cycle to Work scheme, with a saving on tax. Waterproof trousers and rucksack covers can also prove useful. I tend to wear cheap cotton combat trousers as they have a lot of pockets and dry quickly. I personally use walking gaiters to keep my trousers out of my chain and they help keep my shoes and trousers dry from the spray off the road. A thin balaclava or hat to keep your ears warm and gloves that are wind chill and rain resistant are good for frosty mornings. Lights – it’s the law! I strongly recommend USB chargeable ones as you can charge them up while you’re working and you can get some relatively inexpensive ones. The quality does vary though, so read the reviews. If you’re going to go off road or on roads with little or no street lighting, you’ll probably also want to consider an extra bright front light (300-400 lumens on more) that shows up obstacles. High visibility clothing will also help drivers spot you. 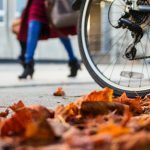 When riding in the autumn, fallen leaves can be a problem, as they tend to aggregate at the sides of the road where you want to cycle. When wet they are slippery and when dry they can hide potholes and nails, so it’s a good idea to keep away from the kerb. Frosty mornings are not too bad, just be careful on quieter roads as they may not have been gritted and can be slippery. You could also consider cycling into work and getting the train home if there’s a convenient one near your home. 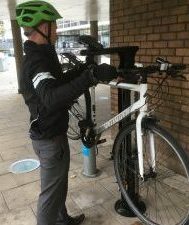 I’m relatively new to cycling; I got a Cyclescheme bike 4 years ago and for the first two years stopped cycling when the clocks changed. A couple of years ago though I decided I wanted to keep going through the winter because getting motivated to start again in spring was hard work! I got a Cyclescheme accessories-only package and haven’t looked back since. This entry was posted in News on September 25, 2018 by Geoff Blunt. Brunswick Street continues to be transformed into a new landscaped, pedestrianised and cycle friendly space, Brunswick Park, that complements TfGM’s Oxford Road Bus Priority scheme, encouraging public transport and cycle use. 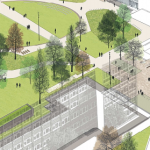 Whilst completion is planned for May 2018, the start of the new academic year in September presents the University with a number of safety challenges to ensure that access is maintained to surrounding buildings for large numbers of returning staff and students. The access routes through and around the periphery of the park are currently constrained by the construction works, and therefore make it very difficult for cyclists and pedestrians to share the same space. As a consequence, the Directorate of Estates and Facilities are actively discouraging cyclists to cycle through and around the periphery of Brunswick Park. ‘Cyclists Dismount’ signage will be placed at strategic access points to the park area, and cyclists are encouraged to walk their bikes to a cycle parking location, or shelter, close to the building that is their destination. To help matters further, they ask that cyclists do not use Brunswick Park as a through route to other locations on campus. Building and wayfinding signage will be erected around the park to help pedestrians/cyclists reach their destination. The Directorate of Estates and Facilities are therefore seeking the patience and co-operation of the University’s cycling fraternity, to bear with them, for what will be a challenging start to the academic year. During the course of the next few months, the contractor will be handing back to the University sections of the completed park, as progress is made towards completion, which should gradually relieve some of the pressure on space for pedestrians/cyclists to safely move around and between buildings in this locality. This entry was posted in News on August 30, 2017 by Rachel Lea. We reproduce this press release without comment! Hundreds of people are set to take to the streets of Manchester for a fortnight of free cycling events including the now infamous World Naked Bike Ride. On Friday 9th June more than 200 brave cycling enthusiasts are expected to gather in Manchester for the incredible ‘bare as you dare’ ride. Ride organiser Andrew Fisher says “It’s all about getting cyclists to be more visible on roads. Drivers say they don’t see you, we’re saying cyclists need to be seen to get their fair share of the road.” Similar events take place in cities across the world and aim to highlight the vulnerability of cyclists. The festival runs for two weeks from Friday 9th to Saturday 24th June. Events include a free bike tour of Manchester’s musical history, a street party, led countryside rides and races with cash prizes. The full lineup is available at http://www.nwvelofest.com. The University has renewed it’s Bicycle User Group membership with Cycling UK. The group affiliation means that individuals can affiliate too and enjoy all the benefits available at a discounted price of £24 per person for annual membership. If you are interested, contact umbug@manchester.ac.uk for the club code and enter it in the box at the bottom of the page when you join via https://shop.cyclinguk.org/membership/affiliate-membership-myself. This entry was posted in News on May 26, 2017 by Rachel Lea. 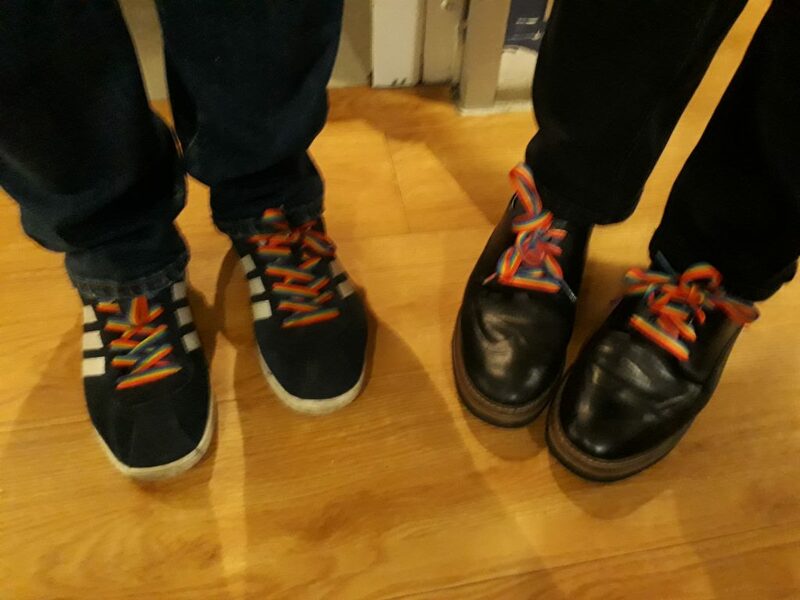 We helped kick off LGBT History Month in collaboration with All-Out, the LGBT staff network group, by wearing go-faster rainbow shoelaces and ribbons to the cyclist breakfast on 1st Feb. Thanks everyone who took part! This entry was posted in News on February 7, 2017 by Geoff Blunt. reporting long-term issues with cycle shelters (leaking gutters). 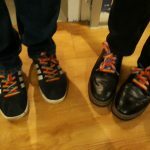 If you are interested in getting involved, please email umbug@manchester.ac.uk. This entry was posted in Events, News on January 25, 2017 by Rachel Lea. UMBUG would like to wish everyone a Merry Christmas and a Happy New Year – we’ll be canvassing your opinions and ideas in January to direct our focus in 2017. Have a great break! This entry was posted in News on December 20, 2016 by Geoff Blunt.